I took a drive out to Crescent Dairy Goats last week. I was on a mission to get some raw goat milk and some yummy cheese. I had enjoyed one of their delicious cheese's, bought from The Dairy in Ponsonby Central last week and upon doing some research realized they are only a 25 minute drive from where I live. It's such a joy to meet the makers of the food you're eating. John and Jan Walter have a small family run organic goat farm in Taupaki. A few of their goats had given birth just a few days earlier. Jon was kind enough to introduce us to their sweet little babies. Their big goats were really friendly and social and wandered up to the fence to say hi. It was lovely to see animals with tons of space and who are obviously really cherished. Bonnie really enjoyed the raw goat milk and we noticed a reduction in her eczema once she started drinking it. It's such a shame raw milk is not easier to get a hold of. One of the cheeses I was most taken with is called a Flat White. It's a rather young cheese. Really fresh and creamy. I wanted to come up with a really great way to serve it. What I settled on was homemade oatcakes: salty, sweet, substantial and wholesome. Served with toasted almonds coated in honey and spiked with fresh thyme. It makes a divine combination. Incredibly moorish and satisfying. This would make an excellent dessert course or a wonderful afternoon tea. The oatcakes are wheat, dairy & egg free with a lovely flavour due to the addition of sunflower seeds and flaxseed. Obviously if you're not able to get your hands on one of Crescent Dairy's lovely little Flat Whites. 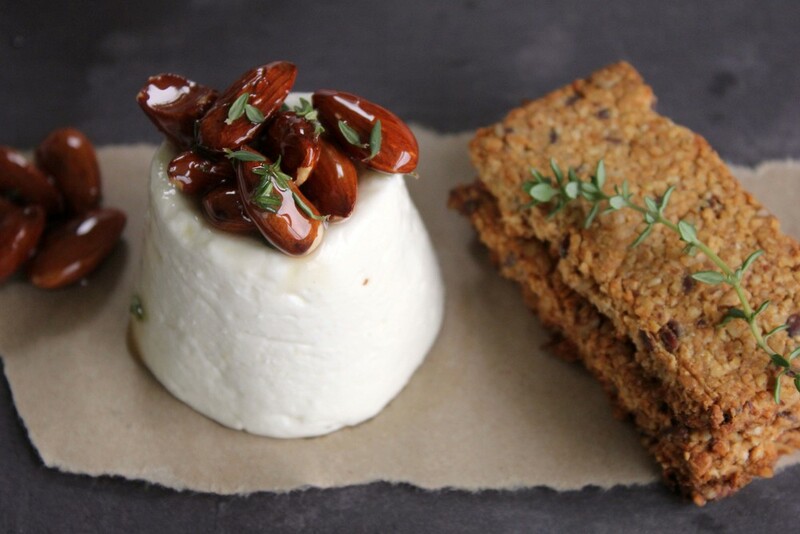 You can use whatever high quality goat cheese you have access to. The oatcakes would also work perfectly with other kinds of cheese's and still be really delicious with vegetable spreads / dips if you follow a dairy free diet. If you live in Auckland, I'd really encourage you to take a drive out to Crescent Dairy one day or pick up some of their cheese at The Dairy in Ponsonby. 3/4 tsp fresh thyme leaves - roughly chopped. Place oats into a food processor. Process until the texture of coarse breadcrumbs. Add sunflower seeds, flaxseeds, warm water, olive oil, salt and 1 Tbsp of honey. Process until well combined. Lay a piece of baking paper on a bench and place your dough on it. Pat the dough into an oval or rectangle shape and roughly flatten. Place a second piece of baking paper on top and roll the dough out until slightly less than 1/4 inch thick. Leave the dough to sit for ten minutes before placing into the oven. This gives the flaxseeds time to bind the dough. Bake for approx 15-20 minutes until lightly golden brown. Gently break oatcakes apart once cool. Gently melt 1 large Tbsp of honey. Pour over the almonds and mix in 1/2 tsp of chopped thyme. Sprinkle the remaining thyme over the almonds just before serving.